Revelation 22:18-19 18 For I testify to everyone who hears the words of the prophecy of this book: If anyone adds to these things, God will add to him the plagues that are written in this book; 19 and if anyone takes away from the words of the book of this prophecy, God shall take away his part from the Book of Life, from the holy city, and from the things which are written in this book. The Papacy is of pagan origin. The title of pope or universal bishop, was first given to the bishop of Rome by the wicked emperor Phocas.This he did to spite Bishop Ciriacus of Constantinople, who had justly excommunicated him for his having caused the assassination of his predecessor emperor Mauritius. Gregory 1, then bishop of Rome, refused the title, but his successor, Boniface III, first assumed title “pope.”Jesus did not appoint Peter to the headship of the apostles and forbade any such notion. (Luke 22:24-26; Ephesians 1:22-23; Colossians 1:18; 1st Corinthians 3:11). The Mass was developed gradually as a sacrifice; attendance made obligatory in the 11th century.The Bible teaches that the sacrifice of Christ was offered once and for all, and is not to be repeated, but only commemorated in the Lord’s Supper. (Read Hebrews 7:27; 9:26-28; 10:10-14). Note: Cardinal Newman, in his book, “The Development of the Christian Religion,” admits that … “Temples, incense, oil lamps, votive offerings, holy water, holidays and season of devotions, processions, blessing of fields, sacerdotal vestments, the tonsure (of priests and monks and nuns), images … are all of pagan origin…” (Page 359). HERESIES are those doctrines and practices which are contrary to the Bible. They are also called “human traditions” or “doctrines of men”. Both Peter and Paul predicted and warned that in the later times “false teachers” would rise within the Church and bring in “damnable heresies” and “doctrines of devils”. (Read 2nd Peter 2:1-3, and 1st Timothy 3:2-5). Jesus rebuked the Pharisees, for they transgressed the commandments of God by keeping their traditions. “in vain,” He said, “they worship me by keeping for doctrines the commandments of men” (Matthew 15:3,9). 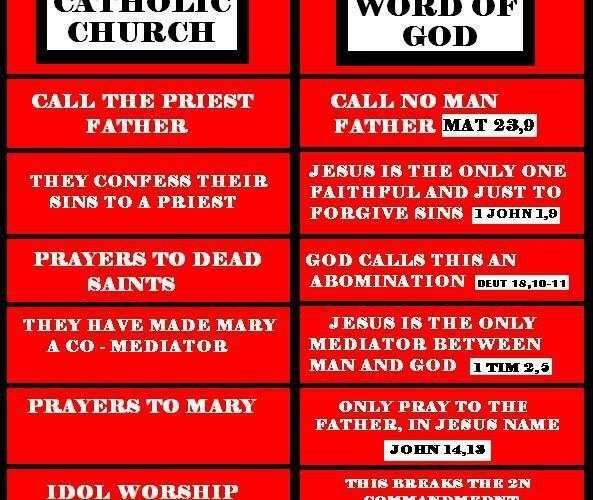 The real heretics therefore, are the Roman Catholics and they need to repent lest the perish to hellfire as the rest have. You can’t do anything about your catholic family and friends that have died, they are burning. Get right with God and teal tell others the truth! Need more proof, read “Catholics should Benlive Their First “Pope” ” and “Apocrypha and Canon – Catholics Wrong Again“.